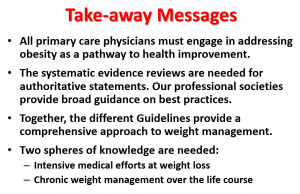 At the 2015 Weight Management DPG Symposium, more than 200 RDN obesity experts were treated to an exceptional tour through a range of new obesity guidelines that have emerged in just the last two years. And the tour guide was Donna Ryan, of the Pennington Biomedical Research Center, who played a leading role in their creation. Ryan pointed out that we have four sets of new U.S. obesity guidelines, more than 44 international guidelines, and three authoritative sets of lifestyle guidelines. But far from being redundant, she explained them as complementary. And she did so with the kind of rare, simple clarity that only someone with a complete mastery of the subject can provide. Take the time to review Ryan’s presentation, available here or by clicking on the slide above. Nowhere else will you find a better understanding of the state of the art for evidence-based obesity care. A widespread bias among healthcare professionals is well-documented. Many of them assume that people with obesity are non-compliant with the guidance they receive. So it’s worth asking, can clinicians do better about following guidance for delivering evidence-based care in obesity? Very good and informative . Thanks.